A Tiny Tiger reaching for the Stars! During each month of the school year, students from across the district are chosen to receive the School Board's Superstar Award for outstanding citizenship. 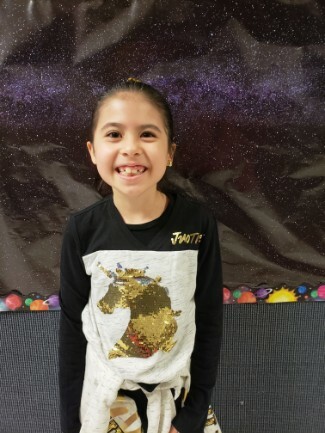 Erma Nash had a representative at the December School Board Meeting, Miss Debanhy Ruiz. What grade are you in? Second grade. What's your favorite color? Blue. What's your favorite thing/activity to do in school? Writing. What makes you a great Tiny Tiger? I care about my friends. Students are chosen based on virtues of outstanding character, citizenship, fairness, honesty, kindness, respect, responsibility, and trustworthiness, and after spending a few minutes chatting with Miss Debanhy, and noticing her excitement and eagerness to return to class, it was very clear why she was chosen as the School Board's Superstar for December. Way to go Tiny Tiger!